Quality Synthetic Wood Blinds made of 100% PVC - Flame Retardant. Our most economical blind! Perfect for commercial applications or as an up-scale alternative to mini-blinds or as a low-cost alternative to our Premium Wood and Synthetic Wood Blinds. Maximum Width (single blind): 96"
Headrail Size: 2" X 2-1/4"
Outside mount flat space: 2-1/4"
Brackets to hold bottom rail stationary. Comonly used on door mounted blinds. Placed between mounting brackets and mounting surface, spacer blocks add 1/4" between the blind and the mounting surface. Most commonly used on door mounted blinds. A 2-on-1 split blind is two separately functioning blinds mounted on the same headrail with a one-piece valance.2-on-1 splits are sometimes necessary on large widths because the product can become stressed and possibly begin to warp over time. The lift mechanism can be over stressed as well on large blinds due to the weight of the materials when lifted.In other cases a split blind may be optimal for the installation. If you have a mullion, or divider in the window and wish to divide the window into two halves that can be operated separately a split blind would be the solution. A 3-on-1 split blind is three separately functioning blinds mounted on the same headrail with a one-piece valance. 2 or 3-on-1 splits are sometimes necessary on large widths because the product can become stressed and possibly begin to warp over time. The lift mechanism can be over stressed as well on large blinds due to the weight of the materials when lifted. In other cases a split blind may be optimal for the installation. If you have mullions, or dividers in the window and wish to divide the window into separate parts that can be operated separately a split blind would be the solution. Control hard-to-reach windows and rooms filled with windows at the touch of a button. The motor is concealed in the headrail and the battery holder may be placed inside the headrail or may be positioned up to 59" away from the receiver. A tile cut-out is used to fit a blind where a portion of the window opening narrows. Typically, this is due to a tiled back splash. Reduce light and ensure privacy with our Routeless Construction feature. Slats are notched on the back side at all ladder positions. Top slat is notched at each ladder position in the front and back of slat thus eliminating the need for holes or perforations in the slats. 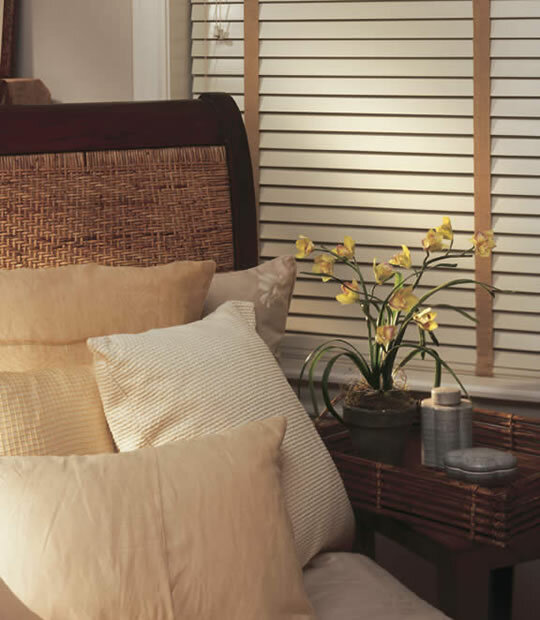 BuyHomeBlinds.com is a online retailer of high-quality custom blinds, shades and plantation shutters. Our products are custom made to your specification and ships in three days. We are thrilled to be your trusted and dependable online retailer. © 2019 Home Blinds of America. All Rights Reserved.